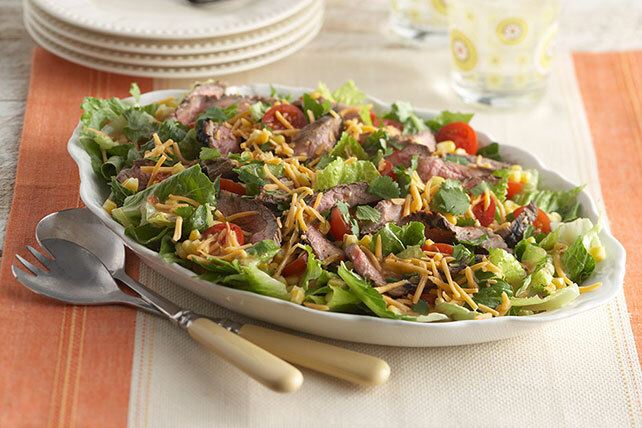 A marinade made with Italian dressing, lemon juice and fresh cilantro gives this flank steak terrific flavor. Serve with corn and tomatoes for the win. Mix 2 Tbsp. dressing, lemon juice and 1 Tbsp. cilantro; pour over steak in shallow dish. Turn steak to coat both sides. Refrigerate 30 min. to marinate, turning steak after 15 min. Heat grill to medium heat. Remove steak from marinade; discard marinade. Grill steak 10 min. or until medium doneness (160ºF), turning after 5 min. Remove from grill. Let stand 5 min. Cut across the grain into thin slices. Cover platter with lettuce; top with meat, tomatoes, corn, cheese, remaining dressing and cilantro. Serve with whole wheat rolls to round out the meal. Substitute beef skirt steak for flank steak. Substitute lime juice for the lemon juice.